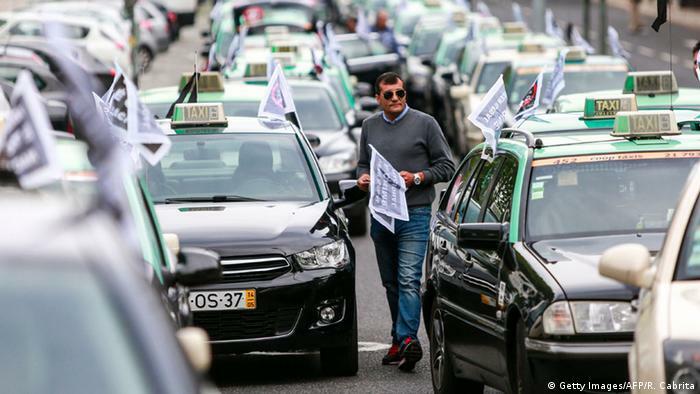 Thousands of taxi drivers have disrupted traffic in Lisbon to show their displeasure at US cab giant Uber. They accuse the company of illegally undercutting their business. Between 3,000 and 4,000 taxi drivers in the Portuguese capital drove at snail’s place through the city on Friday. Around 1,000 protesters also gathered in the city of Porto and around a hundred in Faro, in the south. 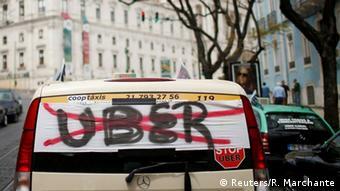 Lisbon taxi drivers tied black ribbons to their cabs and stuck posters on windows saying “Uber go home” and “Uber is illegal.” Access to Lisbon’s international airport was also temporarily blocked and tourists had to use the metro to get to their destinations. The protests were organized by the trade unions Antral and the Portuguese Taxi Federation. “The government has to stop Uber’s operations, which represent unfair competition with the taxis,” Antral President Florencio Almeida told reporters. “We don’t need state subsidies, but we want the law to be enforced,” he added. Last month, Lisbon announced 17 million euros ($19.5 million) to boost the country’s taxi sector, but protesters said the amount was not enough. Taxi associations claim the company has no fixed prices and no accident insurance.The Portuguese Taxi Federation claims business has dropped by 20 percent since Uber arrived in the country two years ago. Uber transfers its earnings from Portugal to the Netherlands under complex tax laws and pays only VAT in Portugal. The company was launched in San Fransisco in 2011 and its business model is based on a smartphone app connecting drivers with passengers. It says it is not a transport company like other taxi firms. Licensed taxi drivers often complain that the company does not pay anything for permits or taxes.